2016 | AA | U.K.
Every urban space has a unique aural signature and is part of a hierarchical meta-system of acoustic spaces. The aural signature is a result of the distribution of sonic events within a space that create an aggregate of acoustic spaces at different scales, ultimately creating a sound environment. Evidence suggests that fidelity of aural stimuli is a significant parameter in creating an accurate spatial mental map of the surrounding environment. The field that is concerned with the acoustic qualities of urban spaces is the interdisciplinary field of Soundscape. Soundscape, as a field and a term, was originally defined as a relationship between the human ear, sonic environment and society, and was intended to be an integral part of urban design. The concept is based on physical parameters as well as on the perceptual and cognitive restrictions. Until recently, the focus of the majority of soundscape design practice is the documentation and preservation of the urban sounds through audio recordings, and this has largely remained within the conceptual realm of music studios. As psychologists and acoustic engineers became more interested in soundscape research, the consideration of sound quality has gained traction. However, the analysis is heavily based on emotional response to soundscape audio tracks in laboratories. Urban spaces have long been designed primarily through three-dimensional geometrical procedures that are presented and evaluated visually. Although the field of soundscape was originally intended as a paradigm shift for urban design, the sound phenomena have remained a secondary design aspect. The process of designing the aural spatial signature of urban open spaces has not yet been made readily accessible to the designer in modes that align with architectural design procedures. This is because spatial designers (architects, urban and event designers) lack adequate design concepts, metrics and tools to integrate acoustic sensory aspects into the design process of urban spaces. A relatively new adjunct theory was developed to relate sound (scape) to spatial design, namely Aural Architecture. There is another new epistemological field that addresses the spatiotemporal formation of sound domains, namely Soundscape Ecology. 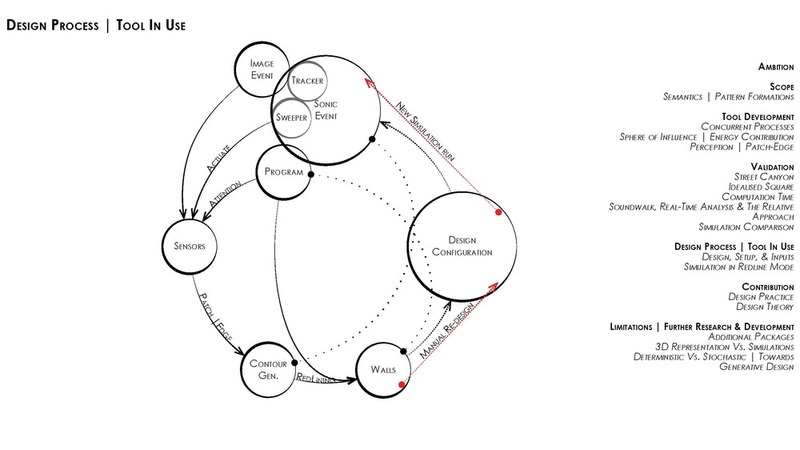 Although these theories offer spatial concepts, these intersecting theories have not yet been integrated into architectural and urban design practices. 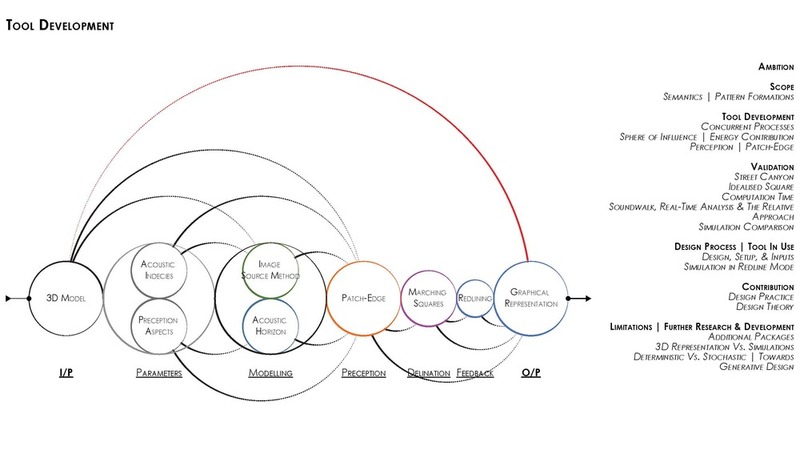 This research seeks to create a tool that integrates the theoretical spatial and soundscape design concepts, to aid spatial designers when considering sound as a design driver for urban design. The investigation is founded on establishing a relationship between aural architecture theories and the urban spatial experience and design. It also explores the merging of spatial and acoustical computational approaches, through integrating the physical/mathematical representation of sound to the mapping of the spatial envelopes and phenomena of human aural responses. The key design-based contribution is the development and calibration of a computational design and decision-aiding tool that can predict qualitative patterns of aural spatial perception, and translate them into spatial attributes within a modelled urban space. The fields of computation simulation, soundscape, and psychoacoustics inform the structure of the tool, the input parameters, and the testing and validation processes this research adopts. 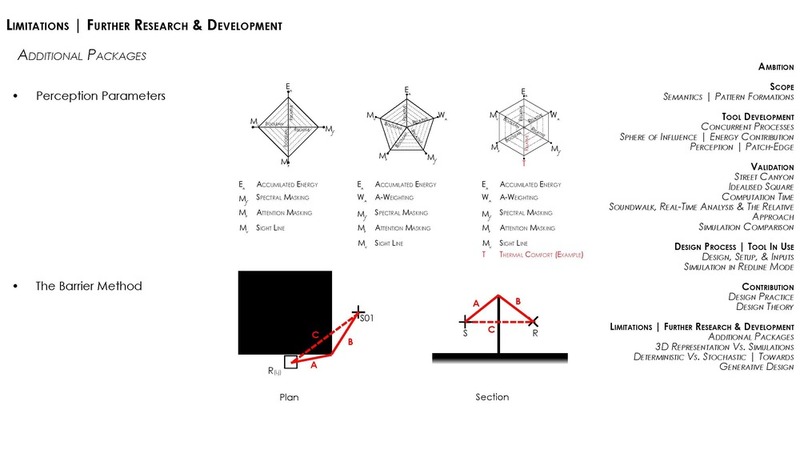 The merging of these concepts and processes are the knowledgebased contribution this research offers to the field of architecture. The tool produces spatial patterns as representations of the distribution of sound energy of predicted acoustic spaces and the intermediary domains between them. The tool structure is built as a JAVA-Based program and is mediated by the current research and the predicted future development. The research trajectory targets a higher complexity that indicates the use of Multi-agent Based (MAB) systems. The short-term goal of determinability indicates the use of the Image Source Method. To that end, the system is designed as an MAB deterministic system that allows for preliminary validation of the predicted patterns and has the potential of becoming a stochastic generative tool. The tool is designed as a portable system that can run on a mid-level laptop by integrating Concurrent Programming to offset the computational time normally associated with the image source method. The distribution structure divides the processes according to the use of the system to compute the image source method, run the perceptual aspects, plot the results, and provide architectural graphical represents. 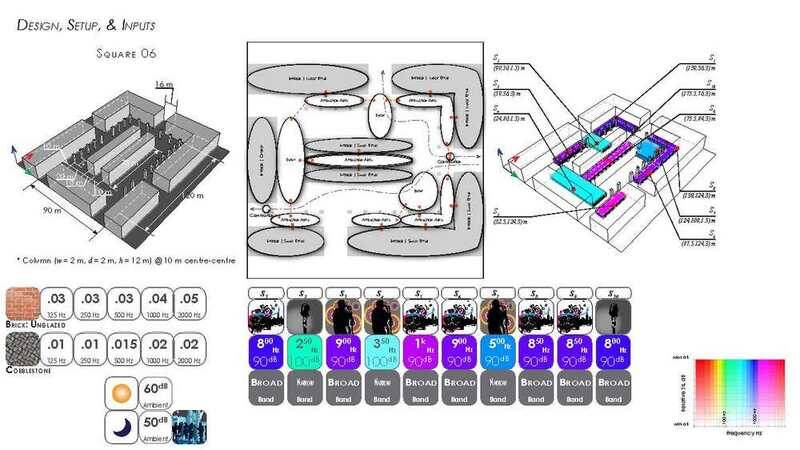 The main goal of this mapping tool is to produce qualitative aural, spatial patterns that can aid designers to consider acoustic sensory aspects during the preliminary design phase, and to provide flexibility that allows further development.